﻿ October 2018 Marketing and Holiday Planning » Red Mango Marketing! « Which Email Marketing Metrics Should Your Nonprofit Measure? Have you started to plan for the holidays? It may feel early, but on average it takes six to eight touches before a prospect takes action. Set yourself up for a successful holiday season by nurturing your relationships with potential and existing customers. Constant Contact has all of the resources you need to have the best holiday season ever! 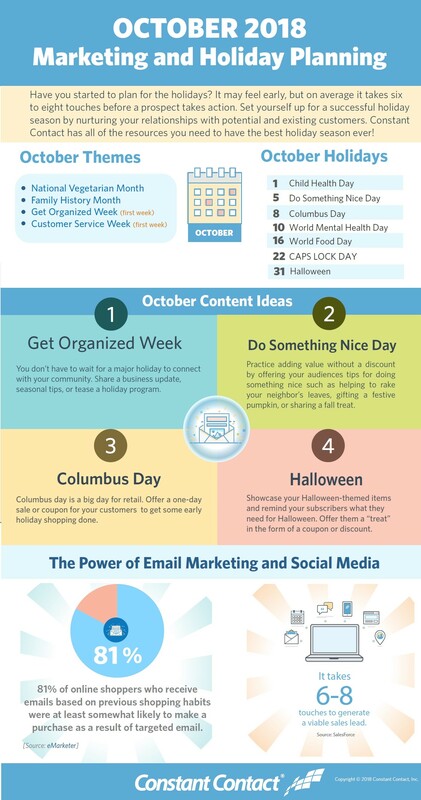 If you’re looking for email ideas this Fall, the October 2018 Holiday Planning Infographic will help you launch your email marketing efforts into the holiday season! The post October 2018 Marketing and Holiday Planning appeared first on Constant Contact Blogs. This entry was posted on Wednesday, September 26th, 2018 at 8:00 am	and is filed under Email Marketing, News & Updates. You can follow any responses to this entry through the RSS 2.0 feed. Both comments and pings are currently closed.